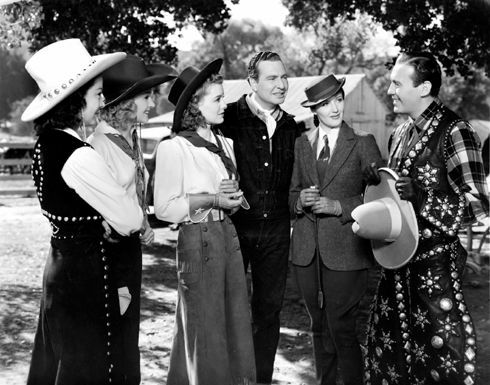 Kate Phillips, second from right, was in Buck Benny Rides Again next to Jack Benny, right. She was in more than 30 Hollywood films and wrote the script for the movie The Blob. Tillsonburg residents will have a chance to meet one of the film industry’s greats. Kate Phillips made a name in Hollywood, starting in the 1930s and spanning more than three decades. One of her best-known contributions to the silver screen is writing the film The Blob. Phillips will be at Kelsey’s Thursday night from 6:30 p.m. to 8:30 p.m. to meet fans. She is a friend of Tillsonburg resident and artist Carole McNeely, and is in town to visit her. The tale of how the two met is intertwined with the story of Phillips’ life and career. Born in Arkansas in 1913, Mary Katherine Linaker, as she was born, made her way to New York City for university and polio treatment. While in university, she decided acting was the career path she wanted to pursue. She made a switch to night classes to complete her BA, and studied acting at Charles Jellinger’s American Academy. One of her classmates was Hume Cronyn. After completing school, she concentrated on theatre. Many of her friends were signing options with Warner Brothers. Unsatisfied with some of the conditions of the contract, including the salary, she simply crossed out the lines she didn’t like and changed them. "I just gave myself a decent salary," she said. Interviewed in McNeely’s back yard, Phillips recalled shortly after she disembarked from the plane, she was taken to the studio’s salon. At the time, she had waist-length hair, which was promptly cut off. When the hair and make-up was complete, she looked at the person in the chair beside her and discovered it was Olivia deHavilland. During her career, Kay Linaker, as the studio named her, was in more than 30 films. She acted next to Hollywood greats such as Erroll Flynn, Jack Benny, for director John Ford, and was in eight Charlie Chan films. While serving a stint with a Red Cross training unit, she met her future husband Howard Phillips. The couple eventually made the transition from acting to writing. In the late 1950s, Kate was asked to write the script for a low-budget horror film. Promised $150 and royalties, she was told where the filming would take place, where equipment could be rented and who could work. A young Steve McQueen was chosen as the lead in the production. When the film was sold prior to distribution, she never saw the royalties. When Kate and Howard were married, they honeymooned in Gananoque, near Kingston. So started annual trips to the Canadian side of the St. Lawrence that continued until eventually, the family bought a cottage in the area. It was there Phillips met McNeely, who ran a gift shop/hair salon in the town. The two became fast friends and have continued that relationship. "She’s my almost-mother and I’m her almost-daughter," McNeely said. "I’m sort of an extra mother to her," Phillips said. At 93, she is the only person alive who had any part of The Blob. That’s even more amazing when one considers much of the cast were teenagers. Phillips is still teaching a night school course on film study at Keene State University in Keene, New Hampshire, where she now lives to be close to her daughter. She will soon be celebrating her 94th birthday. Feared by many, birthdays have become something special for Phillips. She went for a hot air balloon ride when she turned 80, and parachuted at 85. "I don’t know what we’re going to be doing, but it will be something special," Phillips said.